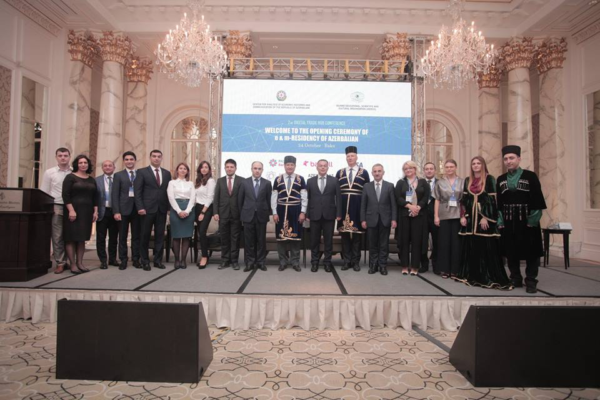 The second international conference on “Digital Trade Hub of Azerbaijan: Opening Ceremony of the e&m Residency Program” was hosted on October 24, 2018, Baku. 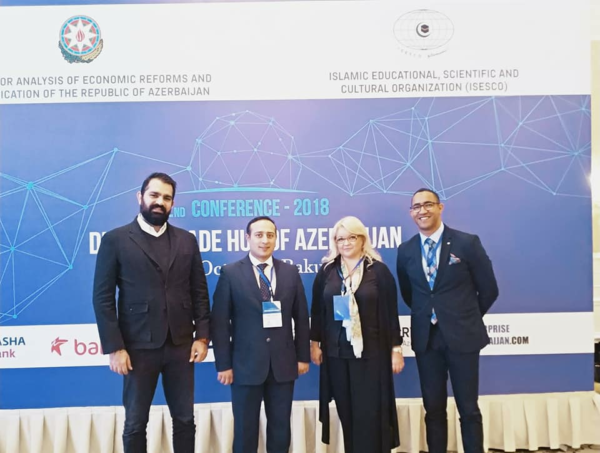 The event was organized by the Center for Economic Reforms Analysis and Communications (CAERC) under the President of the Republic of Azerbaijan and the Executive Committee of the Islamic Educational, Scientific and Cultural Organization (ISESCO). 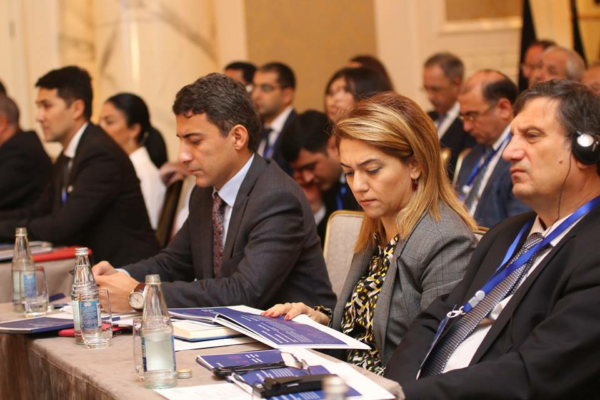 The conference was attended by representatives of the European Union and the World Bank, UNDP, Russia, Estonia, Holland, England, Poland, Switzerland, China, and other countries, as well as state representatives and public organizations of Azerbaijan. 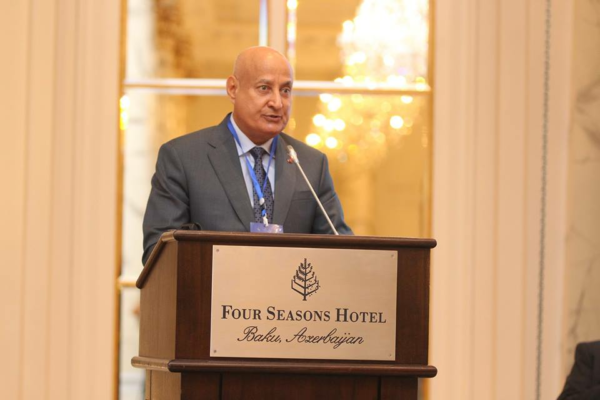 The Executive Director of CAERC, Mr. Vusal Gasimli, delivered a report at the opening of the conference. The Executive Director emphasized that the future of the world economy was determined by following factors: the impact of technology on human life; evolution of money; wealth sharing; launch of new economic engines; the green economy; the geographic distribution of people and the trade paradox. “Considering global trends, Azerbaijan should build a competitive economy in accordance with the spirit of the fourth industrial revolution. The second Digital Trade Hub in the world, the transition to digital trade, the world’s first mobile residency and the second in the world electronic residency in Azerbaijan – this is our country’s contribution to innovative development”- said Mr.Gasimli. 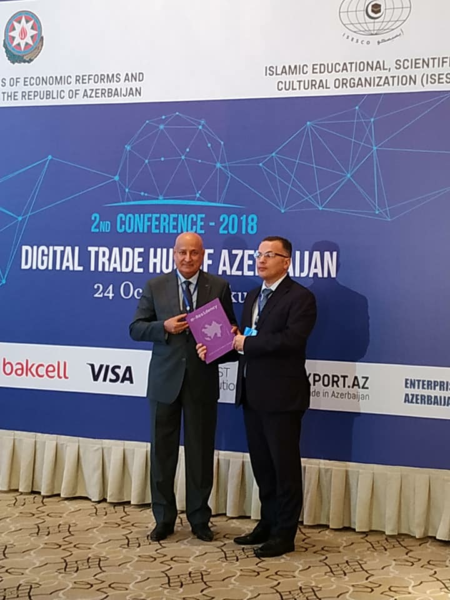 The General Director of ISESCO, Dr Abdulaziz Othman Altwaijri, delivered a congratulatory speech and declared that the creation of the Digital Trade Hub became a great achievement for Azerbaijan. 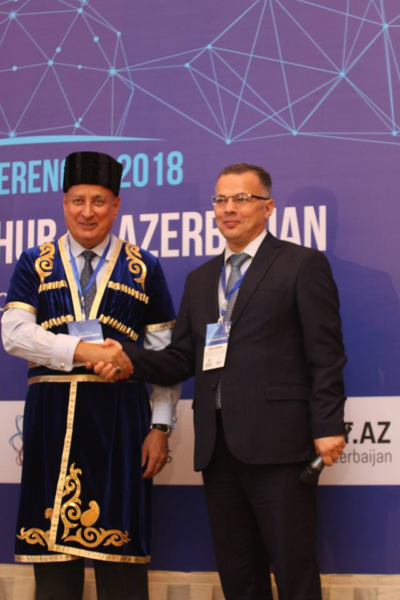 Mr. Altwaijri highly appreciated the contribution and state activities aimed at the development of the digital field and innovative technologies in the country, stressing that Azerbaijan is a center that unites cultures, countries, and innovations. 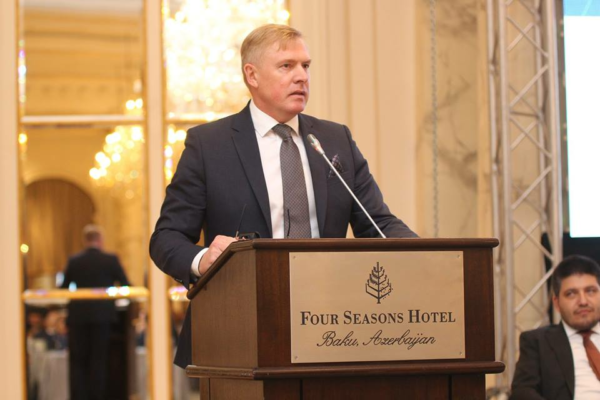 H.E.Ambassador Mr. Kestutis Jankauskas, the head of the EU Delegation to Azerbaijan, also addressed the conference participants with greetings. 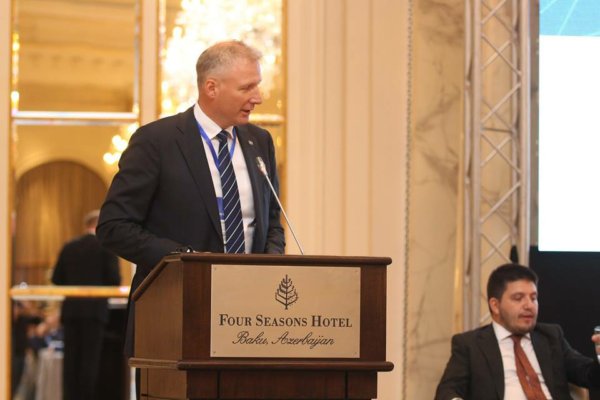 Mr. Jankauskas emphasized the value of the mobile residency project, implemented by Azerbaijan, naming it as the project of future, by saying that “Azerbaijan and the EU should develop a comprehensive partnership. The parties are currently working on a new agreement that covers comprehensive cooperation. Azerbaijan is at the center of the route between Europe and Asia. Azerbaijan’s way of providing links between the two continents constitutes an important factor”. The head of B.EST Solutions Company, the operator of the Asan İmza mobile digital signature service and partner of the Digital Trade Hub of Azerbaijan, Mrs. Jana Krimpe, also delivered a speech. Mrs. Krimpe noted the core values of digital trade and cross-border e-services are trust and transparency between partners; creating quick and paperless processes; equality between partners; the possibility for global reach for all entrepreneurs; availability of service at anytime, anywhere in the world. The main theme of the conference was the implementation of electronic and mobile residency program in Azerbaijan and around the world. Within the framework of the second international conference, the first in the world mobile residency was presented to Mr. Altwaijri and electronic residency was presented to Mr. Jankauskas. It is significant to mention that Azerbaijan becomes the first country in the world to introduce a mobile residency project, as well as the second country after Estonia to provide e-residency to foreign citizens. 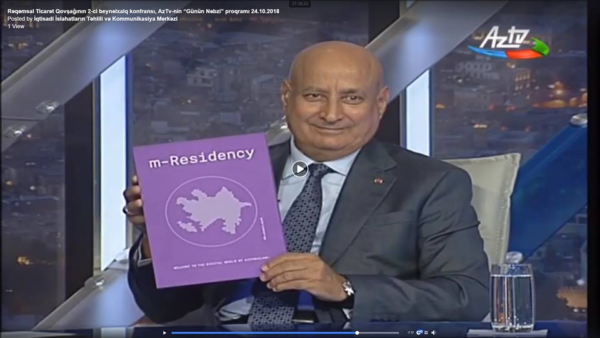 According to the Decree of the President of the Republic of Azerbaijan, all diplomatic missions and consulates of the country are empowered to issue m-residency – Asan İmza digital signature electronic certificates to foreign citizens around the globe. 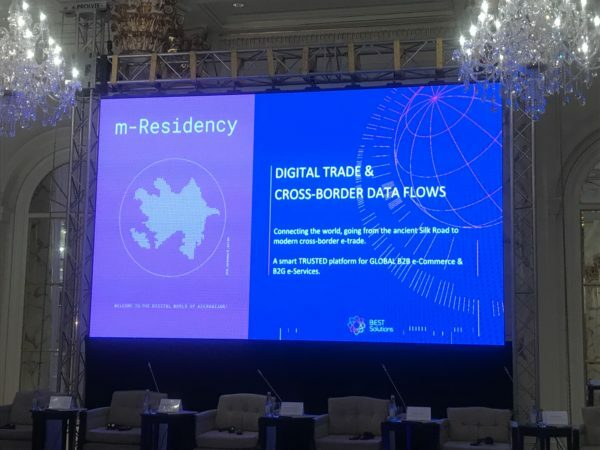 M-Residency is an important innovative tool for improving the investment climate in the country, greatly simplifying business, increasing investment attractiveness for investors and foreign partners willing to conduct business in Azerbaijan. With help of m-Residency, one can register company online, carry out tax and customs transactions online, use electronic and mobile banking services, sign contracts online and many other things without visiting the country. Vice-President of Estonian Parliament, Kalle Laanet; the Head of EDAM Analytical Center, Usal Shahbaz; the Deputy Minister of Transportation, Communication and High Technologies, Elmir Valizade; General Director, Department on State registration and taxpayer recording control, Alakbar Mammadov; First Deputy Chief, State Customs Committee, Anar Suleymanov; Executive Committee Member, Mentor Effect, Bugra Pamuksuzer; Communication Manager Maris Orav; Director of the E-Gov Development Center Fariz Jafarov; CEO’s counsellor “Gazinformservice”, Sergey Kiryushkin; CEO Bridgizz, Ahmed Larouz and many others also delivered speeches in the conference. 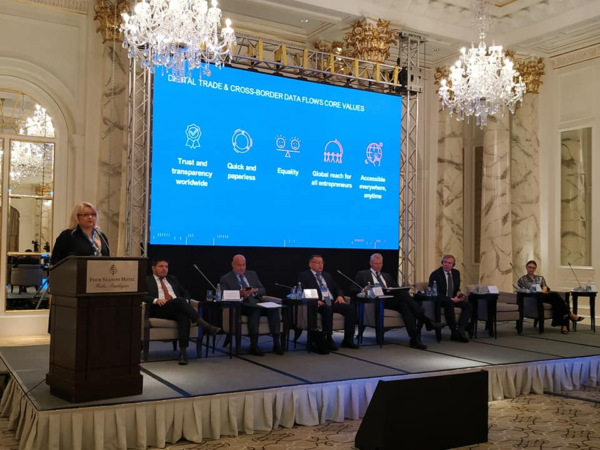 A pilot version on the implementation of cross-border services using Asan İmza between Azerbaijan and the EU, as well as between Azerbaijan and Russia, was also presented at the conference. It should be noted that the pilot system has been implemented with 2000 providers of trust services worldwide. Recall that, according to the decree of the President of the Republic of Azerbaijan, additional measures are currently taken to expand foreign trade operations and strengthen the Azexport.az portal as a Digital Trade Hub of Azerbaijan. According to this decree, “Asan İmza” is issued throughout the world to foreign citizens in all diplomatic missions of Azerbaijan. By the Decree of the President of Azerbaijan Republic dated on September 12, 2017, the Regulation on Azexport.az was approved, according to which users registered on the portal with the help of Asan İmza and also registered taxpayers in the Republic of Azerbaijan will be able to make contracts and sign them with foreign business partners in the electronic form. Other procedures will also be carried out by using “Asan İmza” or “e-Imza” enhanced signatures. Asan Imza is issued by all three mobile network operators in the country: Azercell, Bakcell, and Azerfon.